Myers/Briggs and Carl Jung have their own special personality test. However, it is the art of astrology that truly defines an individual’s personality. Amazingly, it can also forecast the probable physical traits of any individual. Carl Jung was a believer in astrology. So is Bob Dylan. Perhaps you will be too, after we show how Nature’s three key cycles of light (Astrology’s Sun, Moon and Rising Signs) can provide enough information–to pass any personality test! With his music, this Gemini changed a whole generation—as he changed their way of thinking and what they thought. Dylan has an ability to make vivid, verbal images. His Mercury and Venus in Gemini also adds to this mental agility. He seems to have an endless supply of details and concepts, which he uses freely, as he “plays with our minds”. Astrology is the best personality test! 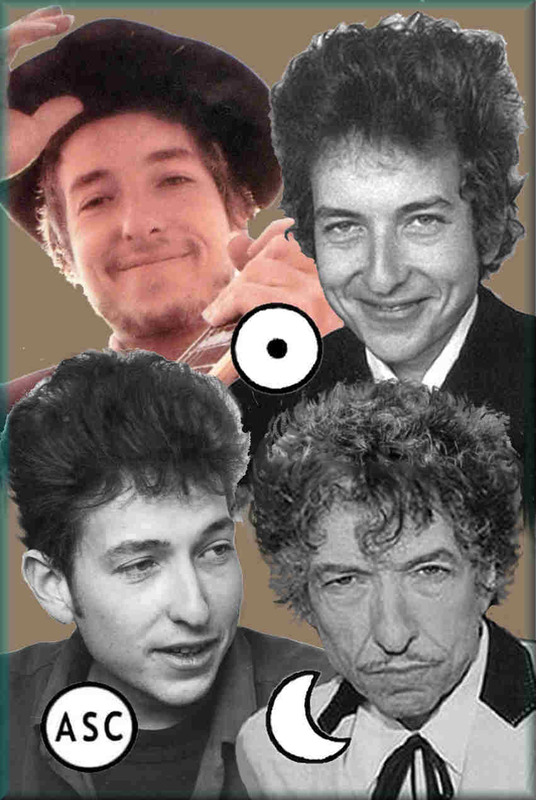 Did the description of Bob Dylan as a Gemini Sun Sign provide a visual interpretation of his nature–one that is only hinted at in those other “personality tests”? But wait, for there are two more layers in Dylan’s astrological makeup: his Moon and Ascendant. They tell us of Dylan’s emotional reactions and the mask or persona that he presents to the world. The big difference between psychologists and astrologers is that star gazers believe that all people are a product of Nature’s daily, monthly and yearly cycles of light on this Earth. Why not? These forces created the amazing variety of species on this Earth–just as it has with humans. Most scientists have not accepted this idea, perhaps because most of them have never studied astrology. Meanwhile, us astrologers find it odd that the personality tests of Myers/Briggs use an odd combination of letters, usually based on a one-time personality test. Will it be different, if you are in a different mood when the test is taken again? In contrast, astrology is definitive, for it is based on one’s exact moment and location of birth. Furthermore, astrology is a very visual art, for it uses the recognizable energy differences in the four elements (Fire, Earth, Air and Water), as it shows the expressive patterns with the three modes: Cardinal, Fixed and Mutable. In their combinations, we see the character of each of the 12 Zodiac Signs. (Note: The four elements correspond respectively to Carl Jung’s Intuitive, Sensual, Thinking and Emotional Personality Types). Like we said, Jung was a believer in Astrology! Now, we will show how these elements and modes clearly define the other two key astrological component define his personality as well as his physical appearance. With the Ascendant or Rising Sign, astrology provides another component to plug into all personality tests. This is the sign that was rising on the eastern horizon at the time of one’s birth. At 9:05 P.M., the mutable fire sign of Sagittarius was rising! With this mutable fire and a Gemini Sun, Bob Dylan shows the skewed facial lines, darting eyes and animated gestures of mutability. It also examines his constant urge to change everything around him. There’s also Sagittarius’ lanky body structure, and the face reveals many traits of the Centaur: The domed head, the long twisted face and the ball on the tip of the nose. Dylan shows us clearly how “ruler placements” and “key aspects” alter the nature of his Gemini personality. Jupiter (the ruler of Dylan’s Ascendant) is in late Taurus conjunct his early degree Gemini Sun. This placement and conjunction greatly modifies Dylan’s physical expressions. Bob often bounces on stage, displaying his mutable fire energies, but quickly the ruling Jupiter shifts him into fixed earth mode, as it alters his solar energies. As his shoulders huddle over his guitar, he locks into his seemingly immovable stance. Highly focused, he seems unaffected by outer forces. Oddly, the expansive air and fire in his personality seems incredibly stilled and grounded—almost Taurian in quality. This fixity is enhanced by his Taurus Moon. The third component of note is one’s Moon Sign. It often determines how a person emotionally reacts to another. (It’s the reflective half of one’s psyche). The Moon’s monthly orbit places it in a different sign every 2 1/2 days. Dylan’s Moon is in the Fixed Earth Sign of Taurus. With this Moon, Bob can become emotional focused, and very controlling. With Saturn conjunct this Moon, Dylan appears emotionally cool, reclusive and hard edged. This arrangement gave him the tenacity and determination to create his prolific works of art. When Dylan reacts to the outer world, the sparkle in his Gemini personality disappears. With this highly disciplined Moon trine Neptune and conjoined his Sun/Jupiter/Uranus stellium, Bob creates his biting commentaries on the ills of society. These aspects intuitively and spiritually connect his earthy emotions to his remarkably articulate Sun, as they inspire him to create and express a constantly changing stream of inventive images. With a touch of saturnine gray, Dylan paints these Taurian feelings by building his masterfully constructed phrases. With the swiftness of Mercury, he delivers his tantalizing messages. The impact is real and it continues to alter the collective consciousness and soul of the world. Did Bob pass our astrological personality test?